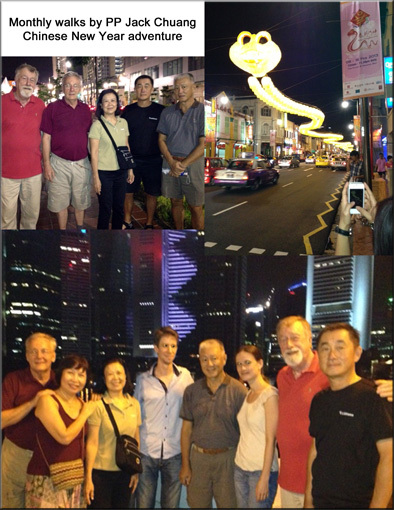 The monthly walks organised by PP Jack Chuang was to Chinatown and the surrounding area. The sultry evening air with bright lights from the main street down Chinatown also known as Eu Tong Sen Street was a riot of colour. A massive lanterned animal of the coming year; The Snake for 2013 created a vibrance of visual light and energy. Not too far away is a lovely path near the Singapore river where a little quiet walk was enjoyed.